Google today has launched a new service called Google Buzz (check Google buzz features) which is their latest approach to sharing with friends and clients, in Gmail. It lets people auto-follow those whom they email the most, or chat with. And then increases users experience of multimedia sharing with them. This Sharing will be public and Google-indexed, or private – just depending on how users choose to share. It’ll be integrated with your inbox in a way that goes beyond normal email. Finally, it will filter out the garbage and leave “just the good stuff. Gmail will automatically know who your friends are, and will update you just below the Inbox tab, and the social stream will have Yahoo! Meme like previews which will work the best with Flickr and Youtube video previews. Pictures will open in a lightbox-type UI. Shared links will feature headlines and thumbnails. Users can post to Google Buzz, and this depends on whether they want to share it publicly on their public profile or just to their friend group in gmail. Notifications of comments, shares etc. are going to reach user’s inbox with a special icon next to the shared and commented items. Google Buzz will have @replies with auto-complete. Users who are @replied will receive inbox notifications. Google Buzz on mobile – The google buzz feature can be used from mobile phone too. It can be used from Google’s mobile homepage, mobile apps, and from a new Google Maps app for the major platforms. When from mobile, Google will guess the location and ask for the confirmation of it. 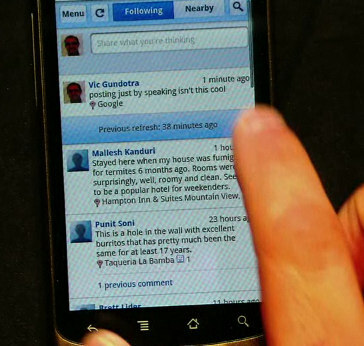 Google also helps in transcribing something that you talked, into text and then share it with your friends. Google buzz is going to have a “nearby” feature using which you can see the latest shares and updates from the location nearby where you are located. Google is going to take location as a relevancy character, and then rank the shared items depending on that. We are still not sure how good this would be, as Google wave was launched as a great communication platform and didn’t work well at all. Hope Google Buzz (although can’t beat twitter in any way) gets some good buzz! Google buzz API will be released soon, and user feeds will also be available. Google will be looking to integrate Buzz into every service of their, including the Google homepage. Google is going to pull in tweets too. Google buzz is not available right away, it would take a few days for all gmail users to get the feature to use. And the buzz feature would be integrated with Google wave too.